This light duty rotary vane transfer pump is portable and self priming. The pump is cast iron and produces a flow rate of 10 GPM. It is powered by DC voltage. Battery cable with clips is included. 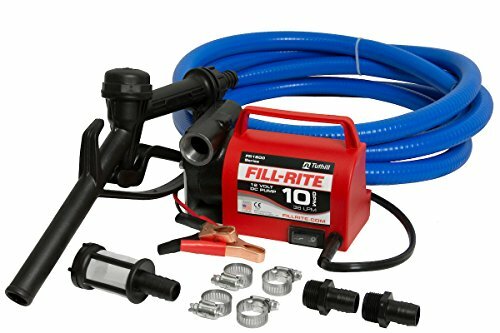 As a complete pump kit it also has 8 of 3/4 inch hose, pick up strainer, for the inlet and outlet, and a plastic 3/4 inch plastic nozzle. The pump is compatible with diesel and antifreeze fluids.